In places of worship and public assembly, we are always in the background supporting the main event. Texas’s religious buildings, houses of worship and auditoriums serve as the cornerstone for some of life’s most meaningful moments and occasions. Don’t let noisy and outdated building systems detract from the peaceful environment and beautiful music that fills your house of worship or opera house. Our building professionals can help your public assembly space deliver to your audience. Brandt offers design capabilities for new and existing facilities that promote acoustics and building sustainability. We can deploy efficient utility systems that include reductions in power factor and demand penalties. Our HVAC system service program can bring improved indoor air quality, comfort and reliability. Put your trust in your Brandt building professionals. 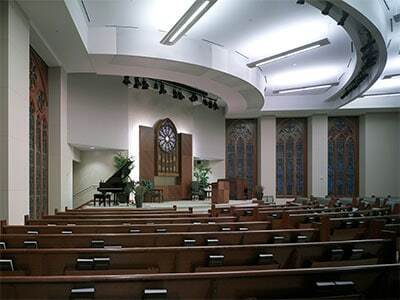 Whether you are retrofitting an existing public assembly hall or building a new church from the ground up, Brandt has the experience to help you design an elegant and awe-inspiring space that works.